I’ve always been intrigued by the cool looking bottle of Proof Whisky. The 20th century medicine bottle shape is reminiscent of prohibition era cocktails, made with doctor-prescribed whiskey. The simple labeling and branding is fairly appealing allowing the golden straw colour of the whiskey to really shine. 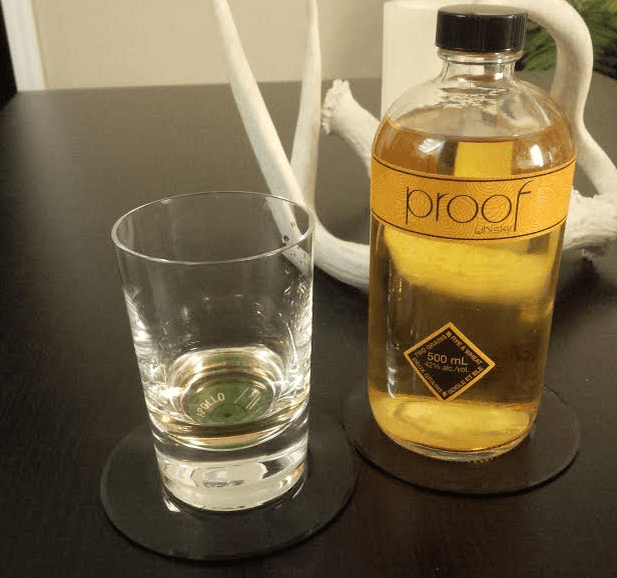 This Friday I picked up a bottle of Proof Whisky to try. This whiskey is made with two grains (wheat and Rye) and with the rising popularity of 100% rye whiskies and even rye pale ales I can only conclude that the added wheat is to cut costs and flatten out the aromas. An honest question for a consumer picking this up for the first time would be, “where is this made?” The bottle says “Proof Brands Toronto” but there’s no mailing address — not even a PO box. Nothing listed on their website either. This did not exactly inspire my confidence. I could only assume it’s produced under contract which I’m not opposed to but its not even giving details of which country this was distilled and bottled in. Did this worry me? No — my sense of alcohol adventure edged me on. The Proof Whisky website describes this whisky as smokey and aged in charred oak barrels. Not sure why they didn’t put this on the bottle. It doesn’t sound half bad — it even has the same ingredient as my favorite beer — Rocky Mountain water! (no points scored there). Proof offers a vodka, whisky and rum, all of which are 42% ABV so there’s no real specialization or focus on taste differentiation. 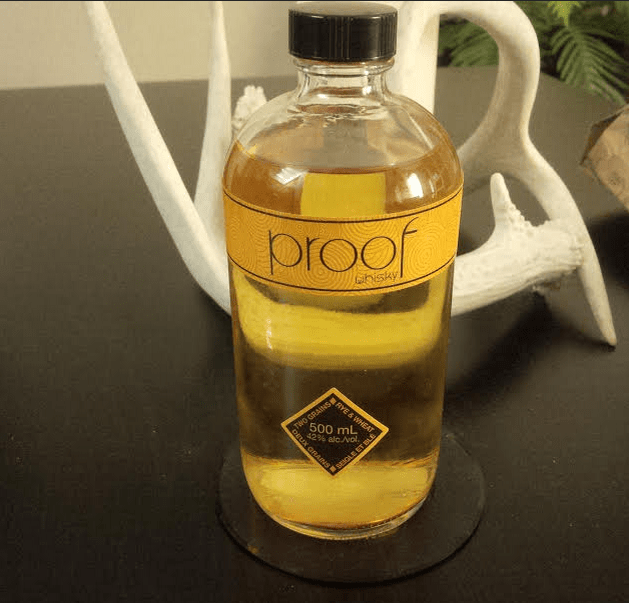 I noticed a difference in tasting notes between the Proof blog and the Proof website where, per the blog, it is more accurately described as lemon drops, lilacs, maple syrup, white pepper and gingery spices. “The Proof is in the bottle,” the marketing touts. Okay. Let’s try this. The aroma of the whiskey is akin to vodka, old white wine, and perhaps some powdery lemon cough drops. It was pretty rough — although not rough in a 120 proof bourbon kind of way. As for the taste, it was pretty damn bland. I didn’t detect any of the smokey notes the website promised. It felt almost like a smooth scotch just rather dull and completely neutered. Proof Whisky is not particularly harsh tasting, there’s just not much too it. I began to warm up to it as some honey notes started to show. One thing I can say for it, is that Proof might be a good mixing base — or a phenomenal one if you don’t want the whisky to show in your cocktail. I would consider using this for several cocktails calling for vodka to shake things up. At $20 for 500ml Proof Whisky is about the same as paying $30 for 750ml. In this price range if your goal is a smooth, inoffensive whiskey this might be your best bet. It just lacks any kind of excitement or adventure, so I’d pass on this one. Although different in style (I’d consider Proof Whisky to be a mixing rye) for the same $30 price point you could be getting something far better such as Alberta Premium Dark Horse which is good poured neat and also serves as a great base for a Manhattan. Overall, I’d give this a 5.5/10 as a sipping whisky but a 6.5/10 as a mixer primarily due to its low price point and fairly solid balance. Due to the white wine and lemon notes Proof Whisky might do well in a vermouth (esp. dry vermouth) cocktail or cocktails using lemon. From reviewing its blog, Proof seems to be positioning itself predominately for use in cocktails, some of which look incredible. The genius of this marketing (and likely most of these cocktail creations) are contributed by Proof Brand’s owner Michael Riley, who worked with brands such as Crown Royal and Chivas prior to becoming Director of Spirits at the LCBO. The use in cocktails from the blog (again, I’m not sure why this is separate) show Proof to be a very engaging mixer and certainly stir some excitement for this whiskey. I’m just not entirely convinced a whiskey that doesn’t stand out on its own merits is going to make a regular appearance in my cocktail mixes.